Hi everyone, I've scheduled this card as family matters are taking priority at the moment. Challenge #11 at Sketch and Stash this week, can you believe it? Please go over and check out the other DT cards, they're wonderful and I hope they'll give you all lots of inspiration. Another gorgeous sketch from Becky, she certainly makes things easy for us with her great sketches. My 'new' stash this time is the sweet little Penny Black image. So many people managed to join in with the last challenge again, thank you so much. I'm sorry that I haven't had time to visit and leave you all a comment, as I love to see all your lovely cards, but I hope you'll manage to join the fun this time too. A gorgeous card Chrissie! 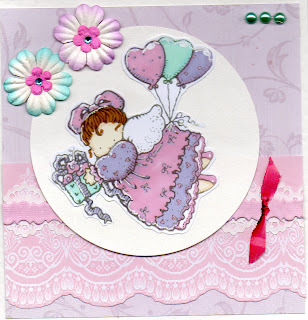 I am loving that Birthday Angel image from Penny Black! oh Chrissie that is just beautiful. I adore the old Penny Black images (only got one - boo hoo) this is one of the best I've seen. Just a gorgeous card. Will join in this month promise. Hope you are okay and family matters are not sad ones. Hi Chrissie stunning card just love love it!!!!! Your card is gorgeous Chrissie, that image is just so cute!! I hope you're having a nice bank holiday. I can't believe it's that time again already. Even though you have other things on your mind you've still managed to make a really beautiful card. Hope things will be improving for you soon. Chrissie, this is just so pretty! 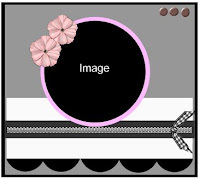 Love the sweet image and your backing papers! What a fun image, Chrissie!! Your card is adorable!